At this First Street Pasture, MBFI is researching how to teach cattle to eat leafy spurge. This page provides information about this particular research project; including the background, objectives, and updates. Leafy spurge (LS) infests at least 1.2 million acres in Manitoba and has direct cost to the livestock industry of $10.2 million based on lost grazing capacity (Economic Impact of Leafy Spurge in Southern Manitoba – Final Report, June 2010) . Cattle show an aversion to eating Leafy Spurge but work done by Kathy Voth (http://www.livestockforlandscapes.com/index.htm) has shown that cattle can be trained to eat leafy spurge as well as many other weeds. This project will test whether this training method is possible and effective. Train beef cattle to eat Leafy Spurge. It is estimated that Leafy Spurge could make up about 5% of the cow's diet. Determine if cattle will eat Leafy Spurge and if the low consumption will be enough to reduce infestation levels. As of May 2017-Of the 50 heifers that were taught to eat leafy spurge in June of 2016, 34 with calves returned to a stockpiled pasture at 1 st Street on May 19 th . It is exciting to find that these young cows with calves are continuing to eat leafy spurge. Evidence has been found of nipped tops, severe nipping and leaf stripping. While the number of stems consumed it not very high it does indicate that the cattle can and will introduce some spurge in their daily diet. High consumption rates are not expected in cattle because the toxic component in leafy spurge will cause digestive upset with high dosages. 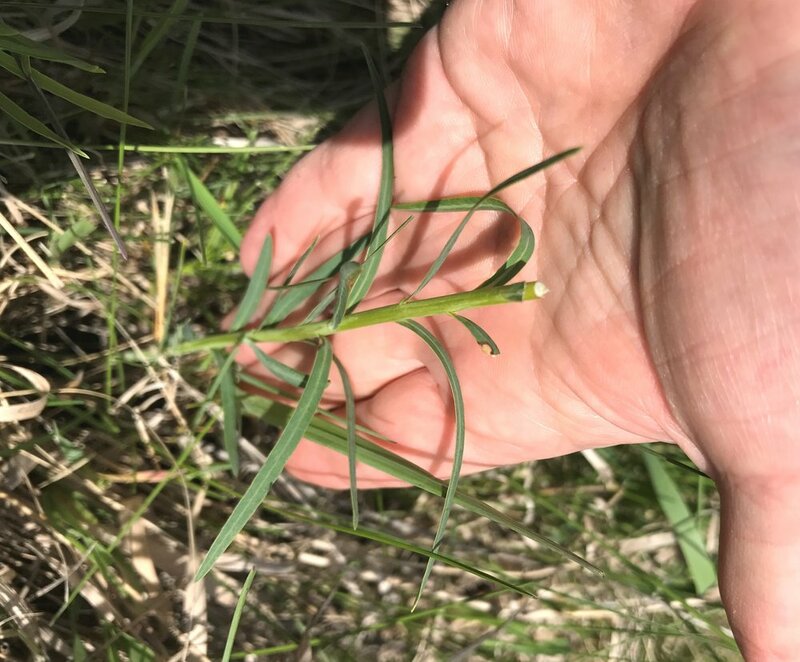 Leafy spurge is not well adapted to grazing and other studies have shown that under sheep and goat grazing the stem density can be reduced by 80 percent in 3 years. So the question remains: what will cattle do over the long-term on a pasture with leafy spurge; will these trained cows teach their calves; and with other bio-controls already on the site can the combination have an economic impact? Twenty five new replacement heifers will be trained in June and grazed with the herd for the remainder of the season. Our June 22 on the 1 st Street Pasture will be highlighting the projects on the site including teaching cattle to eat spurge. As of March 2017-The leafy spurge training program on the 1 st Street Pasture uses Kathy Voth’s training program to teach cattle to eat weeds. 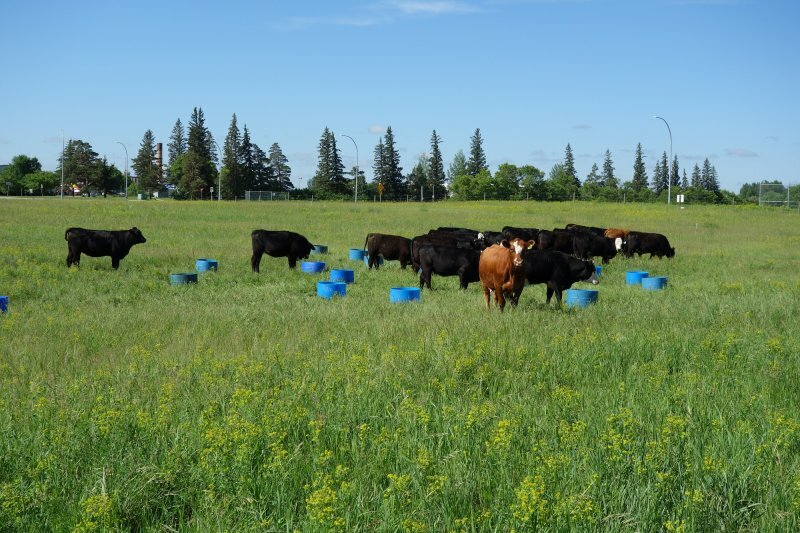 The training program takes seven days and finishes with the herd mob grazing a small paddock with both forage and leafy spurge for a short period of time. In 2016, 50 heifers and 5 cow/calf were trained to eat leafy spurge. During the training process many of the cattle made a good effort to try and eat the spurge. 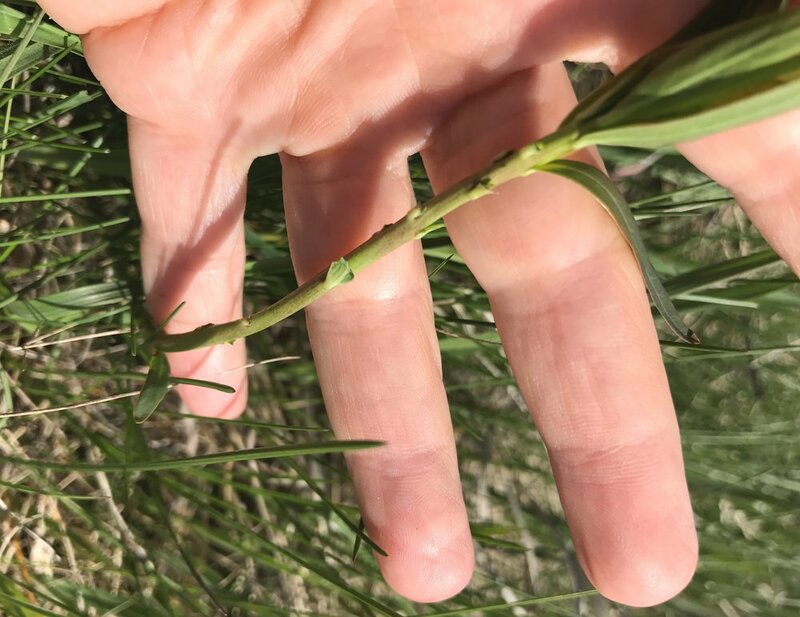 Cattle were then rotated through their paddocks over the summer and staff documented how many leafy spurge stems appeared to have been eaten. The sampling showed that the cattle were eating about 7% of the spurge stems available to them. In 2017 twenty five new replacement heifers will be added to the herd. These heifers will undergo the training process in mid June. The herd will be followed the rest of the grazing season and documentation will be made of the amount of leafy spurge consumed by the cattle.